Hawaiian “Chicken” Salad on Toast. Recently I was very excited to receive some of the new Beyond Meat to try! I tasted some strips out of one of my packages and knew I what I wanted to make right away. Well, truthfully there was more than one thing I wanted to make (lucky I had 3 packages! ), but chicken salad was the first thing that sprang to mind. I loved chicken salad once upon a time and I have had a few delicious vegan versions, but it’s not something I make very often. 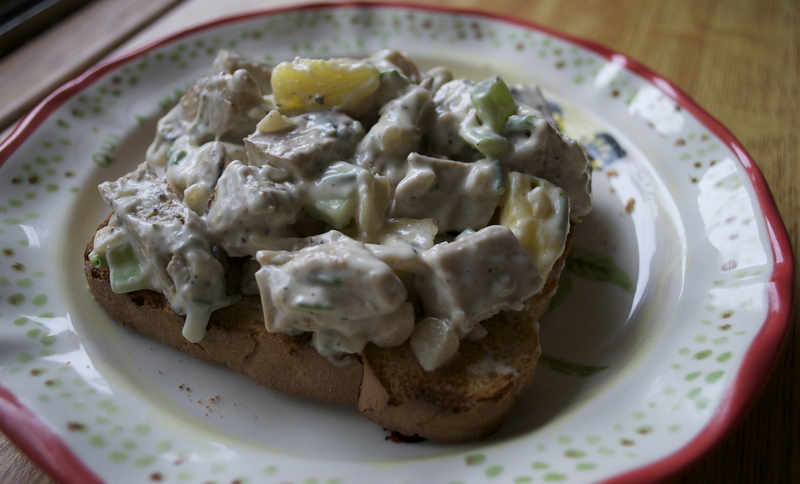 I had some leftover Maui pineapple, macadamias and honey mustard, so I decided on Hawaiian Chicken Salad on Toast…because sometimes an open-face sandwich is better. Whisk all ingredients for the dressing together in a serving or mixing bowl. Set aside. Cut the strips with kitchen shears into desired size pieces. You can also use a knife, but the shears work great for this. Add the strips, pineapple pieces, celery, nuts, and chives to dressing and toss to coat.